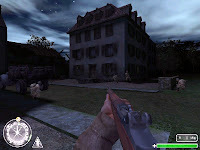 This mission consist of two bsp oriented in the same village ; The first mission (by night) is an infiltration mission. You need to get into the village capture two German and get back to the starting place of the mission (truck). 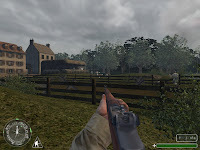 The second one, that take place (by day) in the same village (but extended) is more a fighting mission since the first objective is to take the village and the second objective is to resist to a German counter attack. Everything is here present and perfectly creates a perfect experience. You will need to progress with your squad, realise objective and have some descent fights. All being put together in a well-designed village. The scripting from you squad is also brilliant witch give a even better dimension to the entire release like if it was part of the original game. Is there anything to complain about perhaps some detail like respawn of enemies in several places, the not fully clear objectives (since the map was coded in French I just hope, like the author told me, that it also work with other version) but perhaps it was the aim to make a not too clear mission, and finally the heroic resistance of you squad (you will know what I mean in the last attack) cut a little the realism of this release. I need to mention that those small glitches don’t alter the real quality of this release. In conclusion: The mostly perfect sp release you need to play for CODUO…just enjoy this one.